It’s been FOREVER since my last give away and I thought something summery would do the trick. I didn’t want to spend any money because I’m a cheap skate. So after looking through different things in my creative part of the house, and figuring out that I might have to mail it I decided on jewelry. What a shock. But enough with the griping. Who wants to win this hot summery set?! 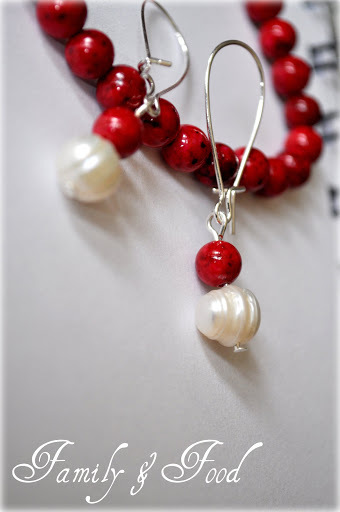 The earrings are made with fresh water pearls and the red stones…I think are a type of onyx. But don’t quote me on that. Aren’t they pretty? 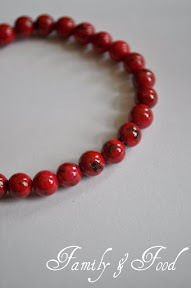 I made the bracelet stretchy so you don’t have to worry about clasps, I’m into stretchy bracelets right now. It’s all about if your daughter gets a hold of it will she brake it or just stretch it. Stretch it please, oh stretch it. Remember to click on it for a bigger prettier picture. So I only came because I love your jewelry and I wanted to see it. But I figured I would let you know that it is indeed pretty…and why not try to win it. haha! 🙂 Anyway, hope you are doing well! gorgeous…simply gorgeous. can’t wait to spend the weekend with you! Alexis, that is beautiful! Have a great time at the beach. Alexis, I saw this through facebook…you are so creative and inspirational! Hope you are doing well! Love it! And am just starting to get into jewelry making myself, so if nothing else, love the inspriation! Have a great time at the beach! Still looking for the “jealous” button. Alexis, these are stunning! I didn’t know you created jewlery…just saw it on fb. Seriously beautiful, Alexis! And stretchy is VERY good with babies!! !